Pretty much everyone has clothing tucked into the back of their closets that they haven't worn in a long time. And the Albany Institute of History and Art -- which has many, many closets -- is no different. Well, except for the fact that pieces hanging in the back of its closets were created by some of the foremost fashion houses of the 19th century. 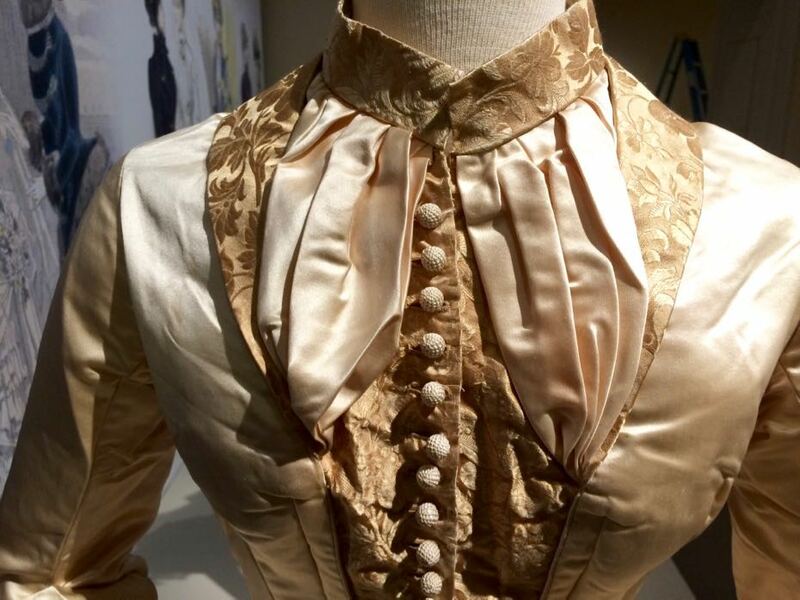 "They're masterworks," said Diane Shewchuk, the curator of the new Well-Dressed in Victorian Albany exhibit, of the pieces. "We have Thomas Coles and Frederick Churches that are masterworks. This is the equivalent. But these are probably what more people would have seen than a painting in a house. So this is really an exhibition about the best of the best, the same way we show upstairs the Hudson River School." If you'd like to get a quick look at the exhibit, there are a handful of photos at the top in large format from a media preview this week -- click or scroll all the way up. 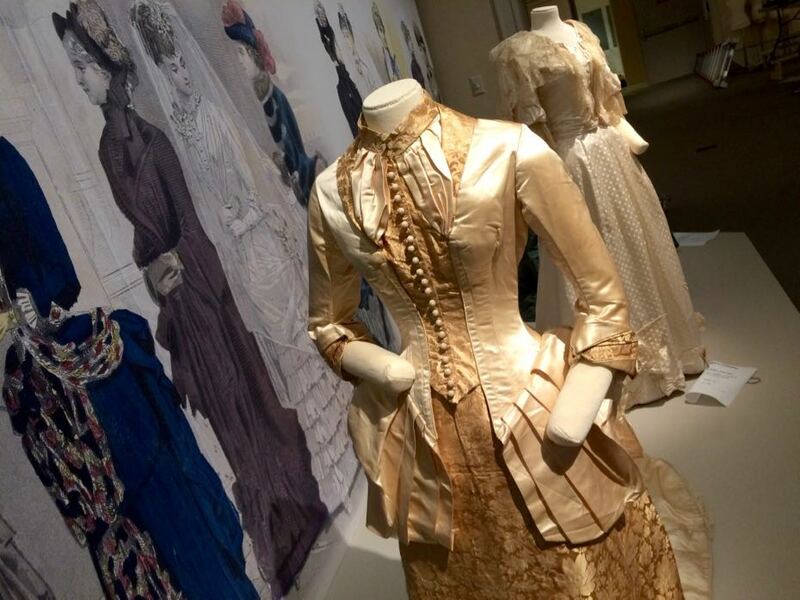 Well-Dressed in Victorian Albany displays 43 dresses from the 19th century that are part of the Albany Institute's collections. 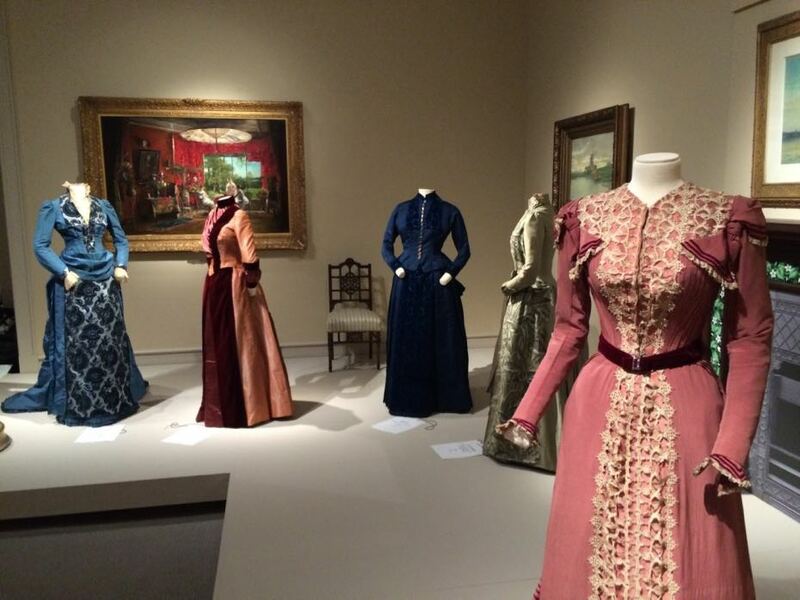 The pieces are examples of the high fashion of the time, worn by society figures and other wealthy women. "Couture fashion is supposed to be crazy, even today," said Shewchuk. "It's not ready to wear. That's what I love about these dresses, there's something extreme about them, but they still follow the style of the particular period." The staging area for the exhibit back in August. 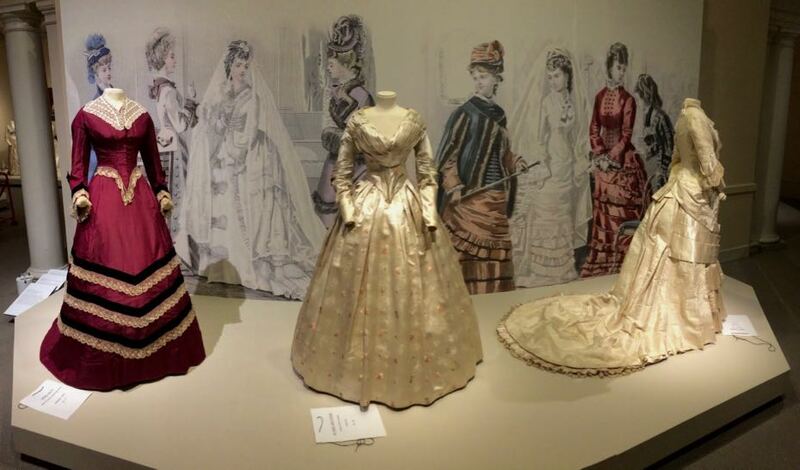 The dresses are displayed in a way so they can be examined up close and, in many cases, almost in 360 degrees. 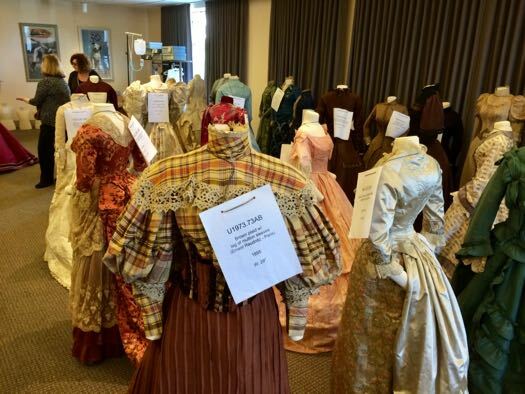 Shewchuk said she wants people to be able to see the fabrics and the detailed sewing, much of it done by hand. Many of the pieces were also designed and constructed to drape and move in specific ways. 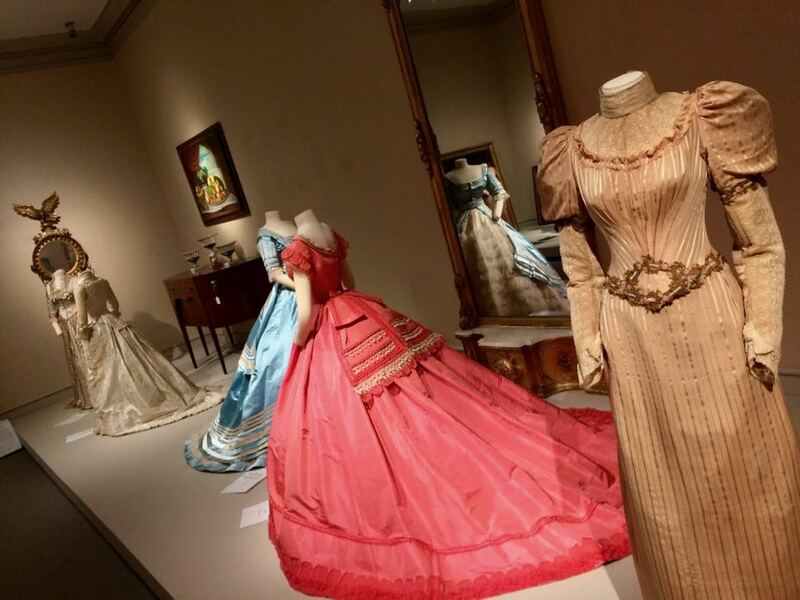 One of the challenges Shewchuk faced in assembling the exhibit was figuring out how to get the dresses to display in ways that suggested these intentions. It was months of shaping and dressing mannequins, and as Shewchuck described, listening to what the dresses wanted to be. "I'd love for people think about how they moved in these clothes, how you spent your day walking around like this, how you spent your day, how you sat in a chair, how you walked down the street." If you were wealthy enough to afford these sorts of clothes, then you were changing outfits throughout the day. Maybe a walking suit during the day, then a dinner dress, and a ball gown. Well-Dressed includes examples of these different sorts of looks, as well as wedding dresses. 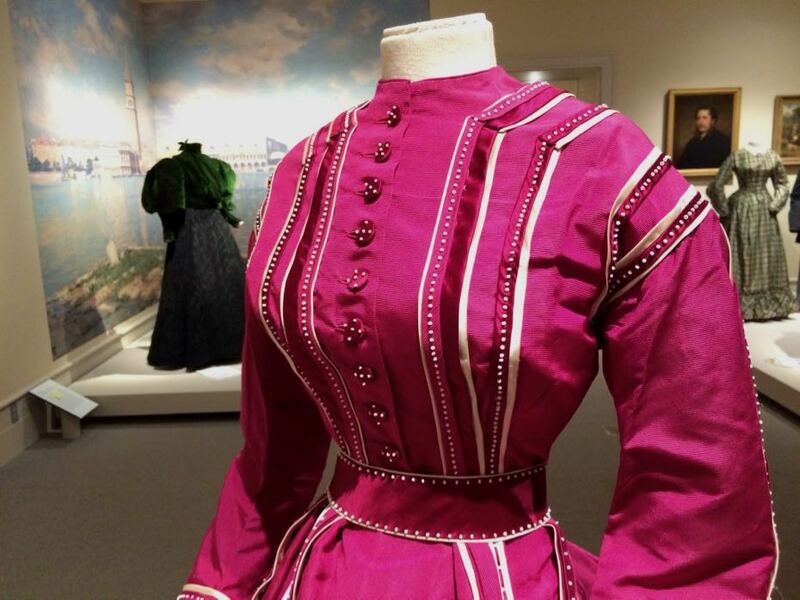 They are artifacts of a culture built upon fashion houses and small armies of dress makers -- there were some 170 of them in the city of Albany in the late 1800s -- and hired help. Shewchuk said the fact that these pieces were saved is a testament not only to their beauty and craft, but also of the role special clothing plays in a person's life. "People relate to clothing more than they do to other decorative arts because you still have to wear it, " she said. "Silver tea sets go out of fashion. But you always might need a special wedding dress or wedding suit. It's a conscious choice to choose something to wear for a specific occasion in your life. So those special occasion moments get saved. And we're happy they're saved." 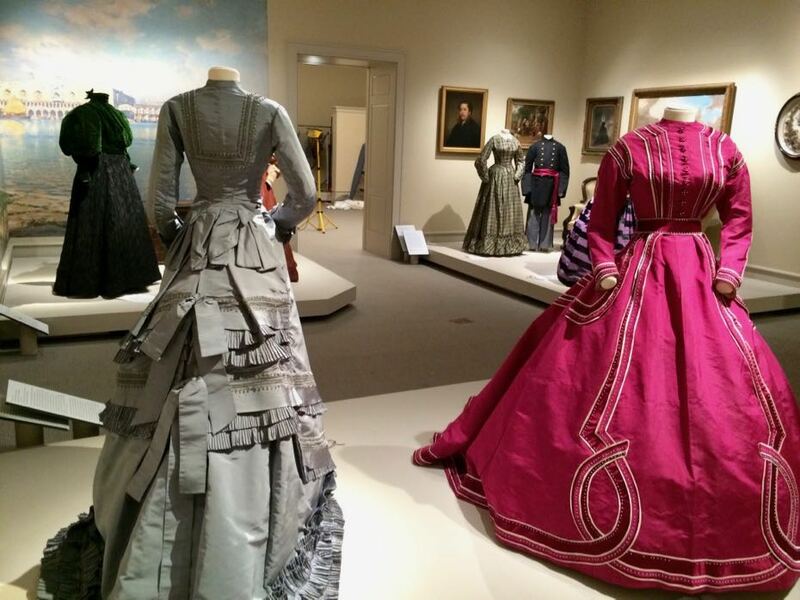 Well-Dressed opens Saturday, October 7 and will be on display through February 19. 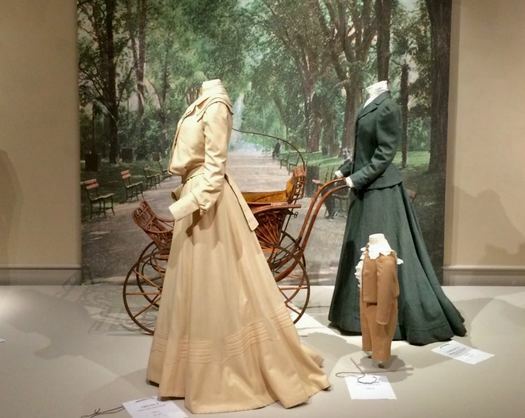 We saw this exhibit yesterday - Some of these dresses were gorgeous! some looked like it would be difficult to move around while wearing,(Does this gigantic hoop in my skirt make me look fat? Or prevent me from getting through the doorway?) and we certainly wondered about the men who designed these clothes. There was one green velveteen bodice, with "gargantuan leg-of-mutton sleeves" that looked like it would have been so hot, so uncomfortable, ugh misery to even imagine wearing it!